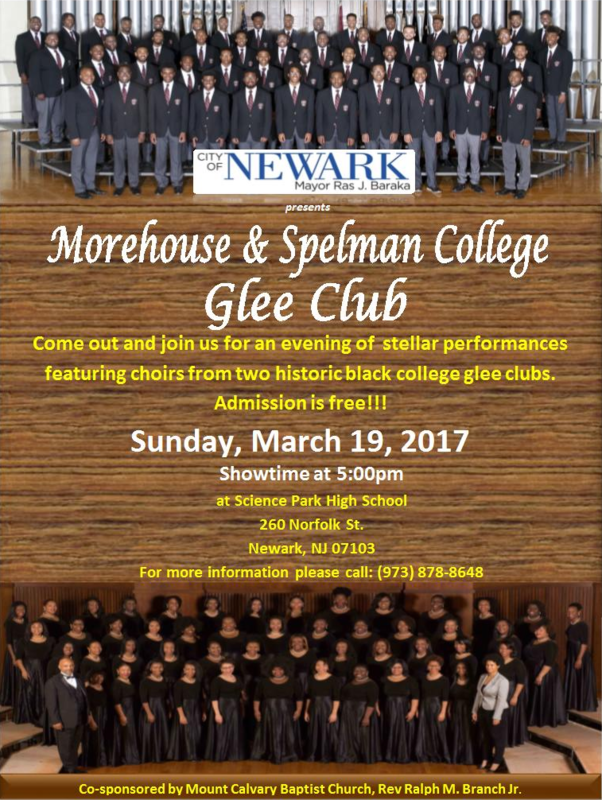 Newark, NJ –- March 16, 2017 — Mayor Ras J. Baraka, the City of Newark, and Mount Calvary Baptist Church will host a free performance by the Morehouse and Spelman College Glee Clubs on Sunday, March 19, at 5 p.m., at Science Park High School, located at 260 Norfolk Street. The concert is free and open to the public. The two glee clubs, from well-known historically Black universities, will provide attending high school students and their families with an opportunity to see the kinds of activities these institutions of higher learning offer, gain an interest in college life, and work towards applying and attending colleges and universities. For more information, call (973) 878-8648.